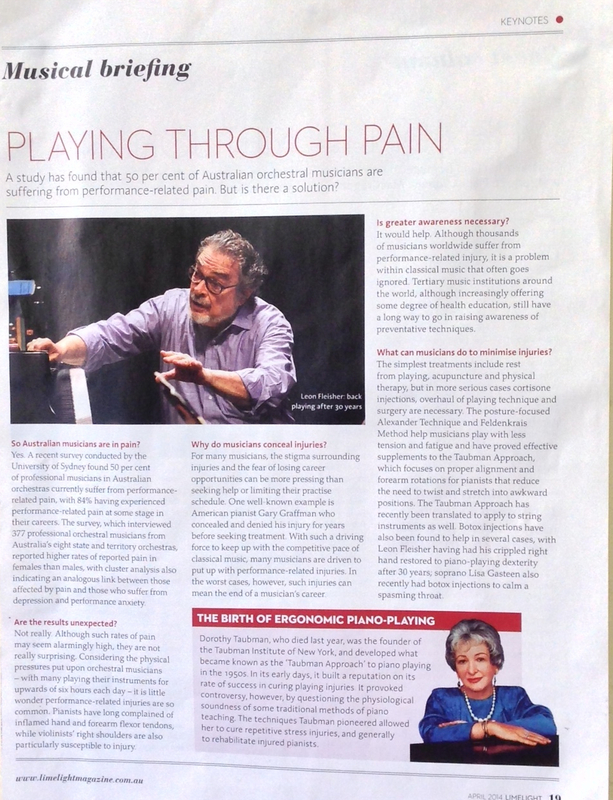 Thank you for drawing attention to musicians’ playing-related injuries, and acknowledging Dorothy Taubman’s huge contribution to our understanding of healthy pedagogy. Unfortunately, there are some misconceptions about this work, which are best addressed through lessons with a qualified Taubman teacher. The Taubman Approach is a complete system, and generally does not need supplementary study. While many principles resonate with Alexander Technique and Feldenkrais, the Taubman Approach provides an intricate understanding of the healthy physical choreography underlying the score. Studying Taubman eliminates, not reduces, twisting and stretching. Other typical causes of injury include: low wrist height (strongly associated with carpal tunnel syndrome), isolated movement, collapses, and keybedding. While rest, acupuncture and physiotherapy may reduce symptoms, the issue usually reoccurs if the playing-related causes are not resolved. Sometimes an injured musician’s technique needs complete retraining, sometimes a series of minor adjustments can immediately improve comfort levels. Certainly retraining cannot be compared to the severity of surgery. Refining one’s movement at the instrument can benefit not only injured musicians, but anyone seeking greater ease, expression, facility, and consistency in their playing. I am happy to clarify any questions regarding the Taubman Approach. Dr. Therese Milanovic, Associate Faculty (Golandsky Institute USA), Brisbane. ← Approaching Bartok’s Rhapsody no 1 for performance.